Catillac is a traditional French pear variety, first described in "Le Jardinier Francais", a popular French gardening book published in the 1650s during the reign of Louis XIV. There is some evidence this variety was grown in the royal orchards at Versailles at this time. Unlike most modern pears, it is not usually eaten fresh, but is brought to perfection by slow poaching or cooking. Catillac pears are fairly large, and store well, and the trees are also big and reliable heavy-croppers, and quite disease-resistant - all important characteristics before modern refrigeration. As well as the interesting fruits, Catillac features particularly attractive spring blossom. If you want to create a traditional French pear dessert as might have been served at the court of King Louis XIV, this is the variety you need. Please fill in the details below and we will let you know when Catillac pear trees are back in stock. An old traditional English cooking pear. Catillac is in flowering group 3. Catillac is a triploid variety and cannot pollinate other varieties. It needs to be pollinated by another tree of a different variety nearby. You can either plant a self-fertile variety (which will pollinate itself and the Catillac) or you can plant two pollination partners which must each be of different varieties and able to cross-pollinate each other as well as the Catillac. If you need further advice on this just get in touch. Since it flowers in the middle of the blossom season it can be pollinated by most other pear trees. Catillac is a vigorous and heavy-cropping variety. It grows well in most climates, including the UK. 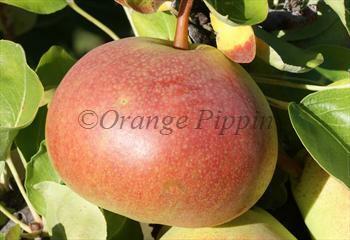 Catillac is a triploid variety and will not cross-pollinate other pears, but is easily pollinated by most other mid or late-flowering pear varieties. Catillac pear was described by Nicolas de Bonnefond (or Bonnefons) in his book "Le Jardinier Francais", which was published several times (due to its immediate popularity) from about 1650 - 1706. He refers to it as Cadillac, which may suggest its origins, in the town of Cadillac near Bordeaux in south-western France. De Bonnefond states it is best used in the period December-January. By de Bonnedond's time Catillac was widely grown in France, and is believed to have been planted in King Louis XIV's "Potager du Roi", the fruit and vegetable garden attached to the Palace of Versailles, which was constructed between 1678 and 1683. It is likely that de Bonnefond was employed by Louis XIV at some stage.